Want to add color to your dinner plate? Growing lettuce in pots is an easy way to bring the farm fresh nutrition to your table for pennies. We will get to know that leafy vegetable that serves well on a cold plate. You might even learn some trivia answers for Jeopardy..who knows? 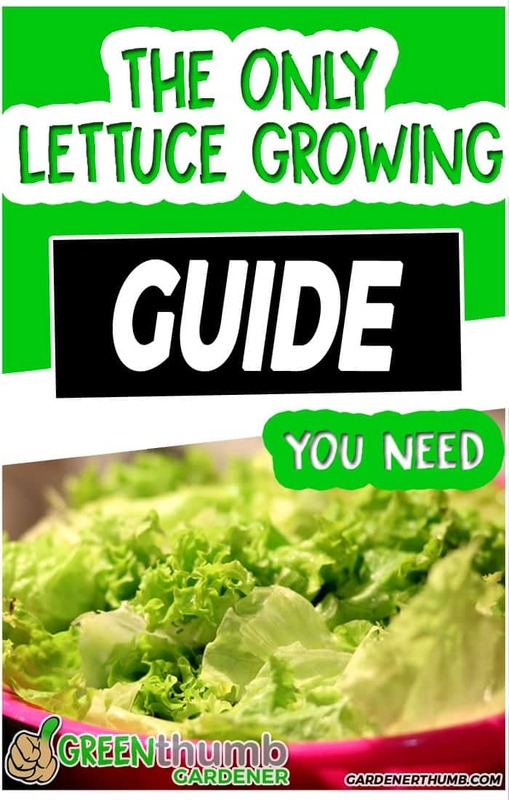 You can learn simply how to grow lettuce by beefing up your knowledge. Let’s get you making gourmet lettuce salad like a boss or maybe for your boss. Growing lettuce in pots is so simple and easy to do. It starts with 2 simple optimal growing materials, a pot or container of about 6-12 inches and rich loamy soil that holds moisture well. Next, you plant your desired lettuce plant seeds, either by broadcast the lettuce seeds or selective plantings. Add water to keep lettuce moist throughout its growing period. The lettuce pot or container does best in a location that gets 3-6 hours of sun per day & prefers cooler weather. 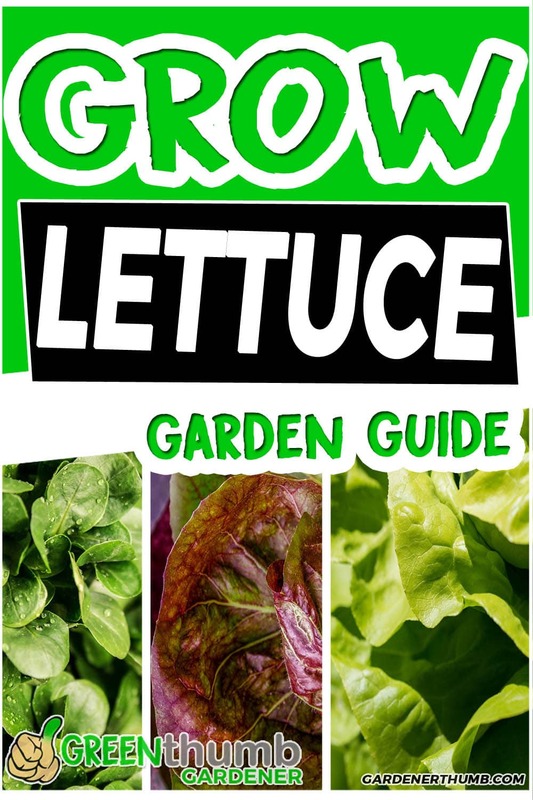 These tips are geared towards growing lettuce in pots, but they can also be used to learn about how to grow lettuce in a garden bed as well. We will sneak in a few tips of growing lettuce anywhere. Really though, the best way to grow lettuce is to simply start with what you got. Lettuce (Lactuca sativa) started out as a weed for the Egyptians until Whole Foods opened up in their neighborhood. Wouldn’t that be cool? Lettuce grew in popularity in ancient Roman and Greece. You know think Romaine Lettuce or Caesar salad. That’s where these lettuce common names originated. Lettuce was even used as an herbal medicine “as a treatment for pain, rheumatism, tension and nervousness, coughs and insanity“. The Egyptians even thought of lettuce to help with sexual prowess. Serve up your oysters on a bed of lettuce greens next time if you are feeling in the mood. Think viagra in your salad bowl. Lettuce has made its way around the world throughout the ages and has even been grown out of this world. Yes, the International Space Station astronauts practiced growing romaine lettuce while hurtling through space at 17 thousand miles per hour. Romaine lettuce made its way into the bellies of astronauts after growing under red, green, and blue LEDs. I guess potatoes were grown on Mars, so lettuce was also a logical choice. Oh wait, that was just in a movie. Growing lettuce in pots has got to be one of the easiest and foolproof vegetable gardening crops to grow. Here are a few other benefits of growing your own lettuce in containers. Garden Space Saver & Convenience – You can grow lettuce in pots or containers to maximize your gardening space. The containers only take up maybe 1 square foot of space. You can fit a ton of lettuce greens in a small pot. We also love growing lettuce in containers so it is close to our kitchen. Cost effective – A packet of lettuce seeds costs $1-2 bucks. Organic lettuce microgreens cost $7 and are not as fresh. You only need to a small pot, dirt, and water. Maybe a little fertilizer to promote faster growth, but it doesn’t take much to get tasty lettuce greens. Let’s get into the nitty-gritty step on how to grow lettuce in pots or a container. 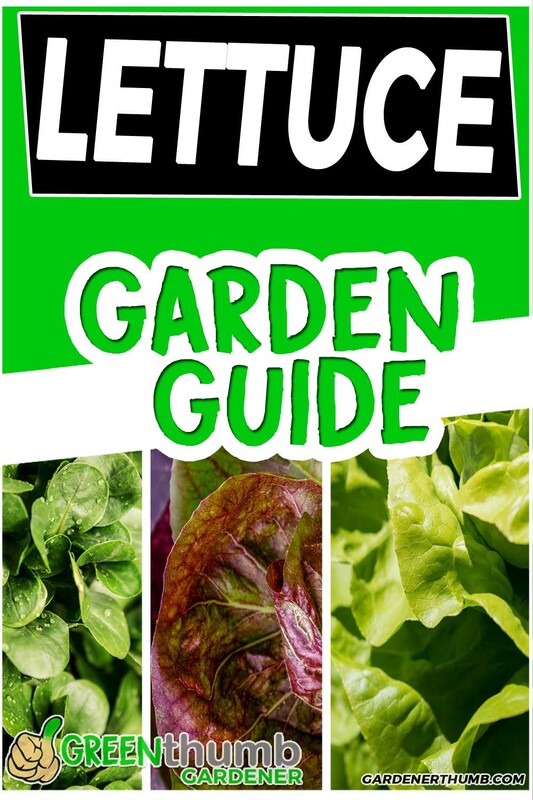 This is the most epic step by step lettuce loving growing guide. We need to gather a few simple materials to ensure lettuce leafy green bliss. 6″-12″ deep Pot or container– Ideally you need something that is at least 6-12 inches deep to be most successful to grow lettuce. You can grow it in a small container for some varieties, but some lettuce plants have deep roots. Sticking with a 12″ pot is probably the best. Rich Loamy potting soil – The best soil for growing lettuce in pots is a blend that will hold moisture well. Lettuce needs to have an ample supply of moisture to keep it in check. You don’t want dried out soil. Stick with your bag of potting soil from the local store. You can also make your own with regular soil, lots of compost, peat moss and vermiculite or perlite. Slow release fertilizers (optional) – You may skip this if you purchase soil that already has these amendments added. Growing lettuce requires a good amount of NPK nutrients, so you want to ensure they have an ample supply of fertilizer from the start. Check out this post here if you want some other helpful hints about container fertilizer choices. 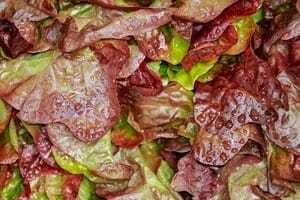 Lettuce Seeds – You can’t grow lettuce in pots without these. Trust me I tried. Head to your local store and look for the salad bowl lettuce variety. Its a packet of seeds that has a mix of different lettuce plants that are usually colorful. You can also get something on Amazon such as these here. Mix your fertilizer with your soil medium. It may be easier to mix this in a bigger container or wheelbarrow prior to adding to your pot. Add your mixed potting soil to your pot or container. You need to have at least 6-12 inches of soil to allow for lettuce roots to grow. You might be able to get away with a little less, but your lettuce might not grow as big or flourish. Broadcast seeds or plant them apart according to your lettuce varieties requirements (usually found on the packet of seeds). You can have them close together for continuous harvests of smaller greens (ie. salad bowl variety) or you can allow them more space to get bigger (ie. Romaine Lettuce). Keep it simple and just broadcast them in your pot or container for ease if this is your first go around. Next, you want to lightly cover your seeds with up to 1/2″ of sifted soil. The optimal depth for growing lettuce is about 1/4- 1/2 inch. Lightly water the top inch of soil once your lettuce seeds are covered. You want to moisten the lettuce seeds enough to promote & ensure optimal germination conditions. We recommend to let the lettuce sprout and grow for 5-10 days before you add liquid fertilizer to your lettuce plants. This answer can vary depending on what you want to grow and how fast you want the lettuce plants to grow. Most lettuce plants need at least 4-6 hours of direct sunlight. It will still grow with a little less sunlight, but it will be longer to harvest and they may be a little leggy. We have successfully grown lettuce with about 3 hours of sun on our back patio that is covered with trees. We prefer to start the lettuce pots in a location about 5-6 hours and then move them to our patio once they have grown a bit. Just keep in mind that lettuce prefers full sun if you want to have the best yield. Partial sun is ok if you don’t mind waiting or you want to keep things simple. A good practice is to also keep them in the shade during the summer to help prevent the lettuce from bolting. Another bonus of growing lettuce in pots is you can easily move them around for this situation. You can pretty much grow lettuce year round with some caveats. Lettuce plants will bolt or go to seed when the days are longer (think summertime) and the heat increases. This time of year is the signal for most varieties of lettuce plants to start reproducing. This is key to know because you may find that the lettuce starts to taste bitter as it gets hotter out. We move our plants in the shade or plan for this in our garden during this time. It is recommended to plant them outdoors in the spring and fall seasons as this is the best time to get a long harvest. You can plant them in the summer if you look for certain varieties that say “slow to bolt” or “heat resistant”. They will still eventually bolt, but you may get a smaller harvest of them. You will know when they are not as edible when the lettuce leaves taste bitter. You may also see a stalk shoot up. Here is a list of the different varieties of lettuce that you can plant. They are grouped in the 4 main varieties of lettuce: Leaf Lettuce, Romaine (Cos), Butterhead & Bibb, and Crisphead (Iceberg types). These types are also best for heirloom or open-pollinated plantings to ensure you can save these seeds for planting future lettuce crops. Black Simpson Seeded Simpson – light green crinkled lettuce leaves have a crisp flavor. Very old and popular heirloom lettuce variety. Parris Island (Cos) – Slightly crinkled medium green leaves that are fairly loose. Its a staple in our gardens during late spring because it is slow to bolt and heat resistant. Tom Thumb – Lettuce heads are very small with crinkled green leaves and sweet flavor. Been around in the early 1800s and was a staple in English gardens. Bibb BS – Outer leaves are thick and dark green colored and the inner are pale green to an almost golden color. Does not tolerate heat. Rossima – Deep red rose leaves with some green backs. Leaves texture is a blistered feel and the taste is sweet and mild. Iceberg – Have compact medium pale green heads that are heat tolerant. This is what you may find in most supermarkets and wedge salads. Great Lakes – Slightly crumbled leaves that adorn a large head. 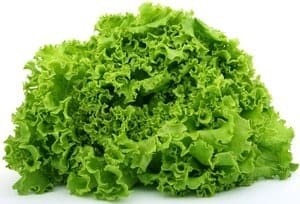 Crispino – Green and slightly glossy looking lettuce that has a firm head and mild flavor. Summertime – Tender and tasty green leaves that resist tip burn. This is an excellent choice for hot weather and summer season. Ok, so you want to be like an astronaut and grow lettuce in pots. You selected some heirloom variety of lettuce from the 1800s. You bought your pot or container and filled it with some loamy soil. 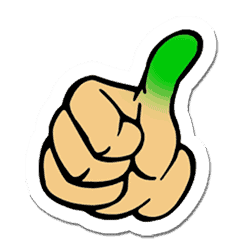 Your seeds have been broadcast and you were successful growing tasty lettuce greens. So what’s next.. Well, you can complete the circle of life by saving the lettuce seeds. The steps to save lettuce are really simple. Check out this seeds saving guide here.